In the fall of 1951, Eduardo Mondlane, a 32-year old native of Mozambique, enrolled in Oberlin College as a junior. This tall, charismatic man who quickly aroused great interest on campus was born in a peasant village in Portuguese East Africa June 20, 1920, the son of a tribal chief. Until he was 10, Eduardo lived a rural African boyhood of poverty caring for his family's cattle. His formal education began in Swiss Presbyterian schools, when a Swiss missionary took on the responsibility for his education, welfare, and development. His "American decade" began as he earned his Oberlin BA in sociology and anthropology in 1953, followed by an MA at Northwestern University, and a PhD in anthropology at Harvard. He married Janet Rae Johnson, a young white woman from Indiana while he was doing a year of research at Harvard. They had met five years earlier at a Christian summer camp, and had continued to see one another, although her parents were intensely hostile to their friendship. Eduardo was appointed in 1957 as research officer in the Trusteeship Department of the United Nations, and frequently traveled to Africa researching and writing about social, economic, and political developments in the trust territories. During a visit to Mozambique in 1961, he was greeted by thousands of Mozambicans who saw in him the leader- ship qualities they required. Because U.N. appointees are not allowed to engage in direct political activity, he resigned from his post that year, and accepted a faculty position at Syracuse University as assistant professor of anthropology. He also assisted the development of an East African Studies Program there. After Tanganyika's (now Tanzania) independence from Britain in 1961, the Mozambique Liberation Front (FRELIMO) elected Eduardo as its first president. Resolved to dedicate his life to "the liberation struggle of my people," he resigned from Syracuse in early 1963 and took up his base of operations in Dar es Salaam, the capital of Tanganyika. By midyear, Janet and their three children, Eduardo, Jr., Chude, and Nyeleti, had joined him there. 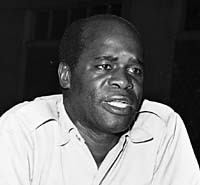 The armed struggle against the Portuguese was so successful that in 1968 the second FRELIMO Congress, held in liberated Northern Mozambique, re-elected Eduardo as president. The struggle continued for the next seven years, when Mozambique was finally liberated from Portuguese colonial control to become an independent nation in 1975. Sadly, Eduardo was not present to share the victory. At age 49, he was assassinated February 3, 1969, in Dar es Salaam, only one year into his second term as president. In a faculty resolution conducted soon after his death, Eduardo Mondlane was remembered as "a strong, intelligent, eloquent, and valiant man--a man of the highest character and ideals. Dedicated to the cause of freedom for his own country, he was in every sense a citizen of the world." An Oberlin student organization, CLAWS (Coalition Against Apartheid and White Supremacy), has spearheaded an effort to establish a permanent memorial to Eduardo, and on May 23, 1998, during the 45th reunion of his class of 1953, a commemorative bas-relief sculpture and plaque in his honor will be dedicated at Peter's Hall. All who wish to attend the memorial to honor Eduardo's outstanding contributions are invited to witness the ceremony. By Albert J. McQueen'52, professor emeritus sociology, busily retired at Kendal at Oberlin; and John D. Elder'53, honorary trustee, who is engaged in pastoral counseling in Burdett, N.Y.